VOSS received the go ahead from the Army in February 2008. Progress has also been made on budgetary support from the government. De Beer said, “We got the green light from Parliament on October 1st 2008, but we don’t have the final agreement yet from the Secretary of State for Defence.” This is expected over the Winter. 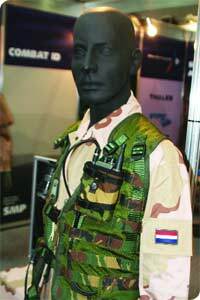 The Smart Vest RFI is planned for early 2009, with a procurement decision planned for 2010. The Smart Vest consists of four elements; the first is the C4I module; the second is power and energy supply; the third comprises the load carriage backpack system and the fourth is the ballistic protection package. Current plans for VOSS call for up to 5500 complete infantry ensembles to be acquired and fielded from 2011–14. These numbers may be revised upward to provide additional ensembles for support troops such as Engineer units. Further ensembles could be acquired in partnership with other countries. De Beer cited interest in co-operation with VOSS from Belgium, Denmark and other smaller countries in NATO. Trials have been scheduled for early 2009 to look again at power needs for VOSS. De Beer explained, “At this point we don’t have a complete picture of the power that we need for performance over 48 hours, also the types of scenario needed. It’s not simply a trial about power supply but also about body cooling as well. Could we improve cooling by having some equipment inside the vest? We previously did a number of trials with the CIM and the Soldier E-Lighter power source. The E-lighter isn’t in the same state of development for example, as the CIM, so we’ll have to do some more tests.” The E-Lighter, developed in partnership with Stork Fokker is a diesel powered fuel source, carried by an individual soldier. Weighing 1.8Kg and situated on the small of the back. It provides power for up to a 72 hour mission. In terms of the outputs, Brouwer explained, one message came through very clearly, “The weight. It is always the question of weight. If you asked the military, ‘If you have the same protection as you now have, but a lighter helmet or better protection for the same weight? they will always want the lighter one.” The goal for the helmet is to be lighter than today’s 1.5Kg. Temperature and climate in theatres today are much different from when the legacy equipment was designed in the 1980s and the IHP is dealing with this. Brouwer said, “Temperatures under the helmet today on operations are over 60 degrees Centigrade. I thought we could do something about that as well.” He explained that the TNO’s experience with passive ventilation has not been successful. 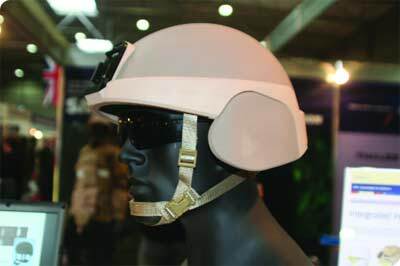 Forced helmet airflow however, will have to be reconciled with CBRN protection. Brouwer explains that their research found that while designs for the protection element of helmets were invariably very good they were often let down by a poor lining systems. The TNO are in the final part of the demonstration phase of the concept design and writing the specification document. The follow on for that will be to undertake benchmark research and begin discussions with potential industry partners regarding the production of the helmet and material suppliers. The TNO’s plan is to start a mini-consortium to go to the prototyping and then in Q3 or Q4 2009, begin testing.